They are awesome creatures! Yes, once in a while they sting someone, but only when they feel danger. So don’t ask for trouble! Try to be friends with bees. You will bee amazed! 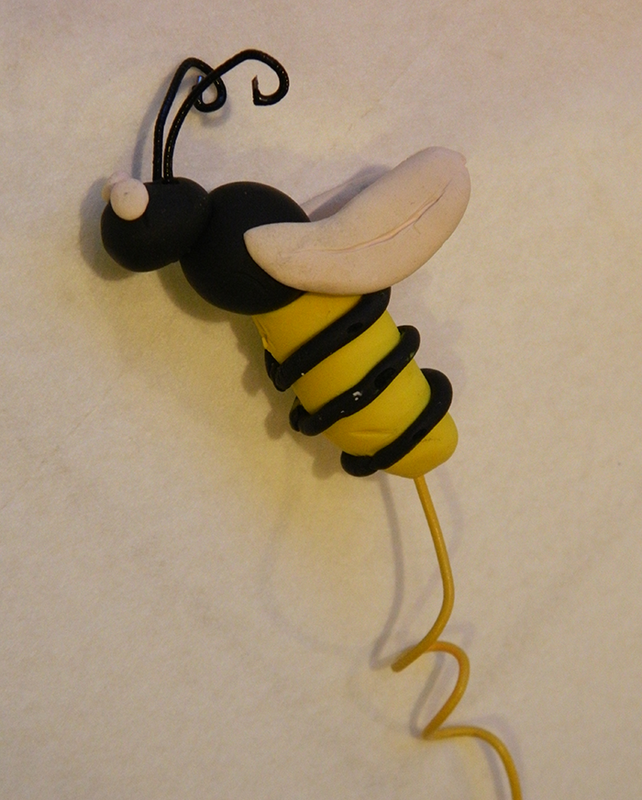 Make a bee from polymer clay. Polymer clay is available in craft stores. It is easy and fun to work with, and can be baked in the oven to harden. Pattern for pieces (optional), attached as a .pdf file. IMPORTANT! Polymer clay is non-toxic, but don’t eat it! If the oven is too hot when you bake it, it can burn and might create irritating fumes. To make the bee, first create the shapes for the wings, body, head, stripes, and eyes. You can use a printed copy of the pattern page to guide you on shapes. You may make the bee smaller, if you like. Put the pieces together to make your bee. To make the body parts stay connected, straighten out a small paper clip and "thread" the parts onto it like beads on a string. After you have rolled a small piece of black clay into the skinniest "snake" possible for the stripes, wrap it around the bee's abdomen, pinching off the the length you need. Make three or four stripes, if you can. Gently press on the tiny eyes. Straighten out the other small paper clip and, using scissors or wire cutters, cut two short pieces from it for the antennae. Use tweezers or needle-nosed pliers to curl the tips. Stick the antennae above the eyes or, more accurately, between the eyes. Straighten out the large paper clip. Curl the middle part of it around a pencil. Stick one end of the paper clip into the bee's bottom. When you are happy with your bee, place her on a piece of foil in a glass baking dish. PLEASE ask an adult to bake the bee for you! Do NOT use a microwave oven. To bake, preheat oven to 275°. Use an oven thermometer to make sure of the correct temperature. Bake 30 minutes. After baking time is up, turn off the oven, but leave the bee inside to cool off slowly. Do not bake too long or bake hotter than 275°. Clay may burn and produce irritating fumes. Read instructions that come with the polymer clay. Work with lighter colors first. Keep sculptures small. Use every scrap and throw nothing away! Look on the floor for stray pieces. How about a whole hive? For another project, make a bee hive and some bees to buzz around it. To make the hive, first roll the clay into a long snake. Then wind the snake into a coil. Make the little bees with just two parts (body and head) instead of three. There is no need for paper clips. Bake the hive with little bees the same way as the big bee. 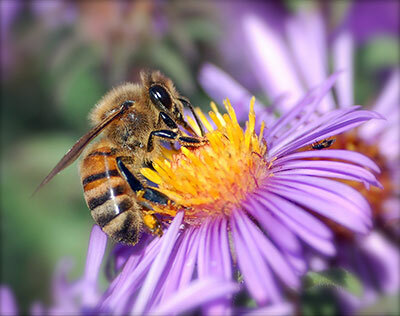 Thanks to bees, we have apples, oranges, pumpkins, almonds, and many other foods that develop from a flower. 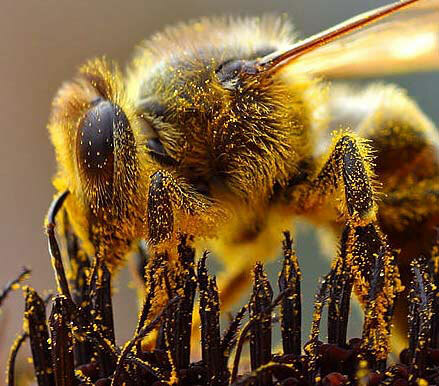 When bees drink the sweet nectar from the flowers, they get covered in sticky pollen. Bee colonies or hives have tens of thousands of bees. This is about as many people as it takes to fill a football stadium! Each colony has only one queen bee, a few drones (males), and the rest worker bees (females). The queen is the only one to reproduce. All the other bees in the colony are her offspring. The queen lives three or four years. She leaves the colony one time to mate with drones from other colonies. Then she spends the rest of her life laying eggs for new bees. The drones live just long enough to go out and mate with a queen from a different colony. The worker bees live a few weeks to a few months. They have lots of jobs. Bees are peace-loving. Only the females (worker bees) sting, and only to defend their little sisters from wasps, bears (like Winnie the Pooh), or other threats . . . like people, maybe. The queen can sting, but rarely leaves the hive. Bees are vegetarians, eating only plant nectar. Wasps, on the other hand, are meat eaters. They use their stingers as weapons to hunt down other bugs to eat. Here is a drawing of the life cycle of a honey bee. The queen lays eggs into the cells of the honeycomb, one egg per cell. Days 1-3 Cleaning cells of the comb and keeping new eggs warm. Day 12-18 Making wax and building new cells in the comb. Day 14 onwards Guarding the hive entrance, foraging for nectar and pollen. When the queen is nearing the end of her life, the workers begin to raise a new queen. Their bodies make a special food called royal jelly. To make a queen instead of a worker, they feed a larger portion of the royal jelly to the chosen larva. Farmers and beekeepers and scientists are worried about bees. Bees are disappearing around the world. They are calling it “colony collapse disorder.” The cause is not obvious or simple. Researchers think several factors may be contributing. Credit: John Sullivan, Wikimedia Commons. Pesticides: Chemicals meant to kill other insects that eat crops could accidentally harm the bees. Loss of the bees’ habitat: Development of wild areas, abandoned farms, growing crops without leaving habitat for wildlife, and growing gardens with flowers that are not friendly to pollinators. All these contribute to poor nutrition for bees, making them less able to fend off diseases. Infections: Certain harmful mites, fungi, and viruses have infected many bees. Global warming: May cause the flowers to bloom before the bees have come out of hibernation. If some of the plants have finished blooming, the bees will not have as much to eat. Again, poor nutrition could make the bees less able to fend off diseases. Plant flowers that provide nectar and pollen. The Climate Kids “butterfly garden” can also be a bee garden if you include lots of flowers. Credit: John Severnjc, Wikimedia Commons. Do not use insecticides or chemical fertilizers on the flowers. Don’t swat the bees! For one thing, they may sting you. For another, you will be stopping their vital work for the environment—and us. Foraging bees find new sources of food (flowers) for their hive-mates. Then, they return to the hive to let all the other bees know the location of the food by doing a “waggle dance.” Depending on the angle of the dance move and its length and number of “waggles,” the bees tells the other workers in which direction the food is and how far. She is busy as a bee. I’m making a beeline to the beach. Our new food blender is the bee’s knees. (It's the best in its class). My mother has a bee in her bonnet about the party. My uncle is a drone. He has not worked in years. (He lives on the labors of others, like drone bee). Another threatened insect is the butterfly. Find your state butterfly and learn how something so beautiful can come from something as icky and squishy as a caterpillar.